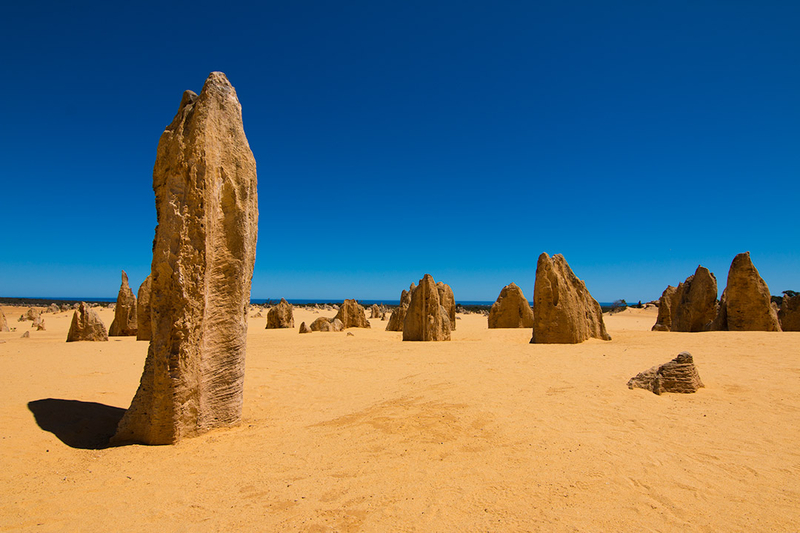 The Pinnacles are a mystifying collection of craggy limestone pillars scattered around sandy Nambung National Park, about a 2.5 hour drive north of Perth. 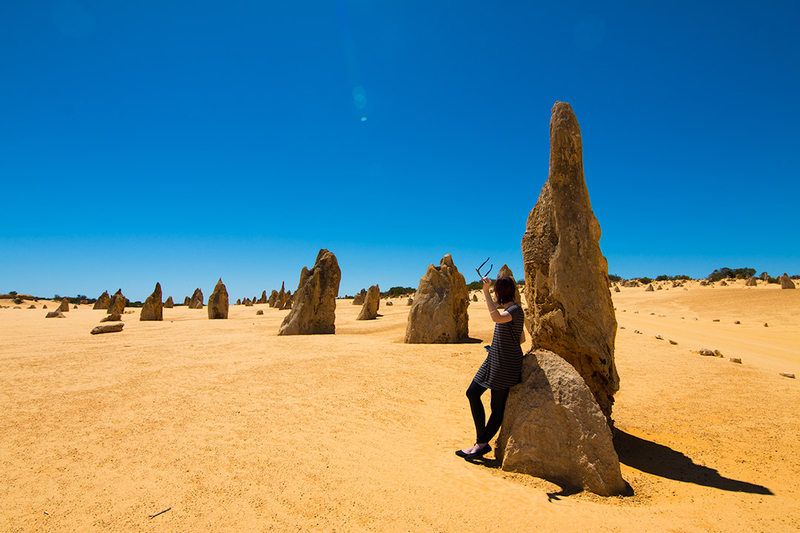 There’s so much to see in Western Australia, and you’d really need at least a month to truly explore the region, but with this intriguing sight so close to the city, I jumped in my hire car and set off on an adventure. With the sunlight fading and relying on moonlight alone, I found a good spot and set up my tripod. As I visited in mid-October, the Milky Way season for the Southern Hemisphere was coming to an end. 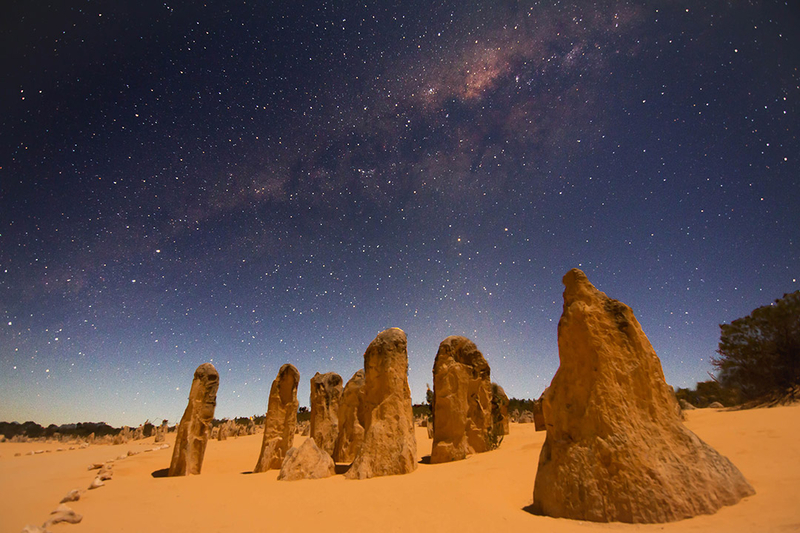 This means that the galactic centre of the Milky Way sets on the horizon not long after the sun sets – and the sun needs to be a fair way below the horizon for the light pollution to not affect your visibility of the stars. But, considering I’d come this far, I thought I’d give it a shot and see if I could capture a few good photos. There’s not a whole lot to do out in the middle of a weird sandy desert, during the night, while waiting for the stars to come out, so I did what any normal astro-nerd would do…I decided to listen to The Martian audiobook (for the millionth time), because I totally felt like Mark Watney on Mars out there. It was about 9pm, I’d gotten a couple of shots, and the rustling bushes and shadows were starting to play tricks on my mind, so I decided to call it a night. I drove a couple hundred metres, and came to a fork in the sandy road. I didn’t remember seeing this when I drove the circuit earlier in the day. 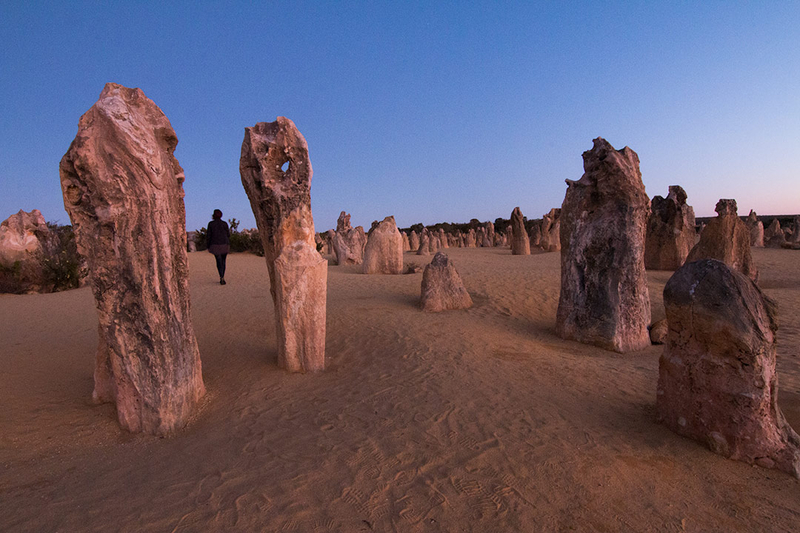 To the right, an arrow pointed to The Pinnacles Drive, and to the left, nothing. So, I went left. Excellent navigation. 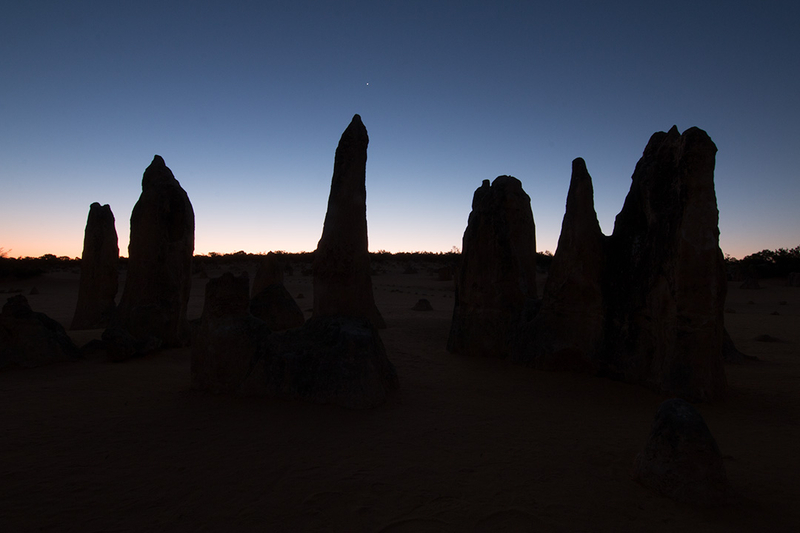 At the time I thought, well, I’ve just DONE the The Pinnacles Drive, I don’t need to go around again, so I’ll go left. Note to self: this was the incorrect route. 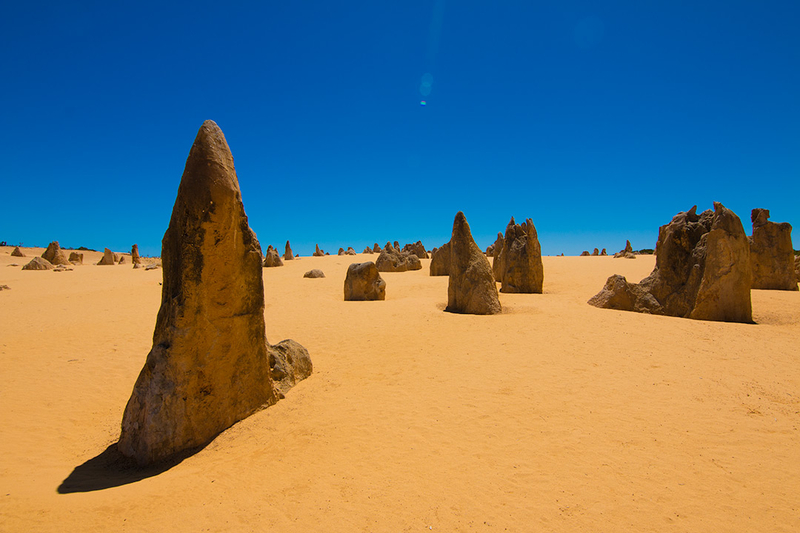 I continued along slowly, going 5-10km/hr navigating around the rocks and creepy pinnacles, failing to notice that the rocks that are placed to create a “road” in the sandy desert had disappeared. I was thinking to myself that nothing looked familiar, but I continued driving, assuming that nothing would look familiar at night in this desert. Then I got to a wide open expanse of desert sand, with no tracks, and that’s when I realised I’d gone off road and was completely lost. I shone the car’s lights off into a couple directions trying to spot anything that could help me and all I found in the distance was a sign that read “No Vehicle Access”. I turned the car around, but the wind had blown sand over my tracks and I started to panic. I grabbed my phone. 8% battery left. Rookie error. Even worse – no reception. Then the rational side of my brain tried to find the calm in the situation – I could sleep here in my car. I had less than a quarter tank of fuel (rookie error #2), and certainly didn’t want to waste it driving around a sandy desert in the middle of the night. As I sat in the car, staring at my phone in silence, trying to figure out what to do, I caught a blip of reception. Like when Mark Watney catches a signal coming from the Aires 4 hab! I quickly loaded up google maps and that glorious blue dot lit up, showing me how far off course I had gone…but more importantly, that I needed to go EAST! I pointed the car in the right direction and sped off. I managed to find the circuit again and weaved around those pinnacles like nobody’s business. In hindsight, I probably could have popped a tyre and should have taken it slow, but I wanted to get the hell out of there. About 15 minutes later, I made it to the wonderful highway again. If I wasn’t so scared of giant killer snakes, I would have got out and kissed the bitumen, but instead I headed back to the hostel for a good night sleep. Bonus Story: Bry gets lost in a different national park the next morning. 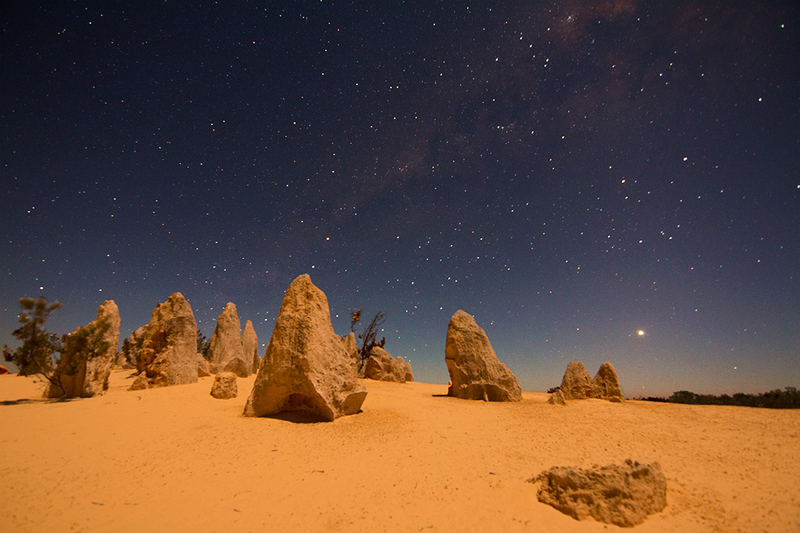 When driving along the coastal highway in Western Australia, you will notice a few things. 1) Red dirt and thick green spiky bushes lining the highway. 2) White sand hills in the distance. 3) Flies. 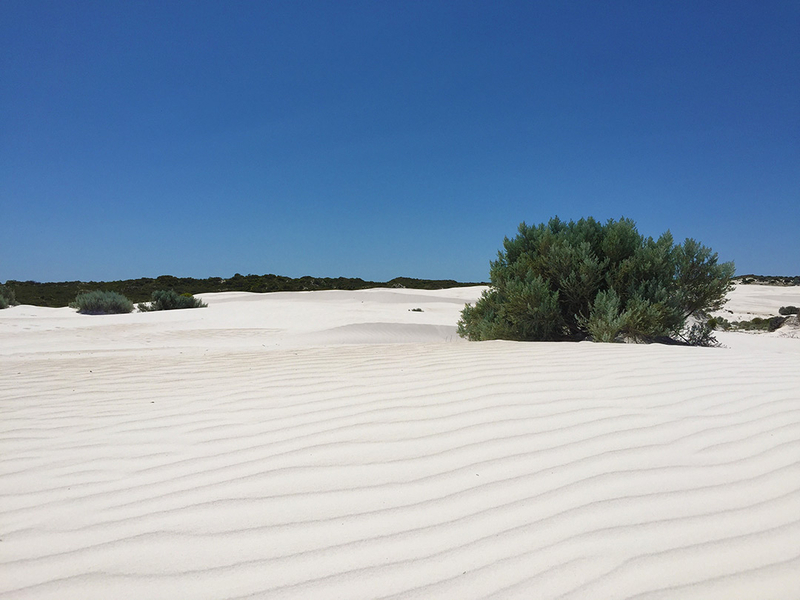 I was heading back to Perth from staying out at Nambung National Park, and I really wanted a photo of these spectacular white sand hills – I’ve never seen anything like them! I pulled over on the highway and hopped out. The bushes were way too thick to get through and again, killer snakes, so I got back in and drove onward. Having no real plans, I saw an exit labeled “Wanagarren Nature Reserve” that looked like it headed toward the ocean, so I turned off and continued driving. A few kilometres down the road I saw a bunch of 4WD tracks, and they looked like the headed straight to the amazing white sand hills! I jumped out of the car and immediately jumped back in again. Turns out I had about half the world’s population of insects squished on the front of the car, and as soon as I stopped, 3 billion flies came for a feast. 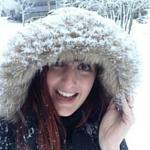 I grabbed a scarf and wrapped it around my face, jumped out and ran. I made it up a 4WD track to this small peak (only about a 3 minute walk), and low and behold the stark white, wind-swept sands were ahead of me. I removed my scarf to enjoy the view and promptly got 53 flies stuck behind my sunnies, all buzzing around trying to get out. Seriously, I have never seen so many flies in my life. I made my way down the other side of the hill and around a bunch of bushes until I came to the sandy hills. I snapped a few photos, but the flies just kept landing on my lens! I was so in awe of this place that I just had to go walking on it. It looked so beautiful – the way the wind had created stunning rifts in the sand and the incredible contrast of the white sand, the green bushes and the blue sky (and the black flies). After wandering around for a while, I turned around and (unsurprisingly) the wind had blown away my footprints. Considering last night’s escapades, I immediately freaked out. I was in a valley and I had no idea which way was out. I got off the sand and back to the 4WD tracks. I found the one I had followed and relaxed. There really wasn’t a need for me to panic, I’d only walked a total of about 7 minutes from the highway, but I clearly hadn’t quite shaken that feeling from last night. Needless to say, I made it back to the car, which was no longer blue, but a crawling shade of black flies. I made it inside and only about 20 flies followed me, so I hit the gas, wound the windows down and blasted some music. 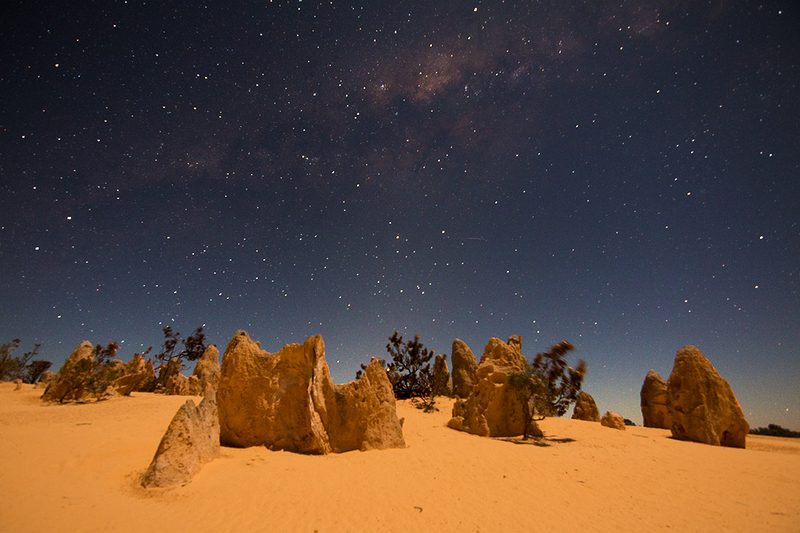 Mission accomplished – A successful few days exploring a couple of Western Australia’s beautiful national parks. I will be back! Thanks Michelle! Haha I definitely think if a ranger came around I would have peed my pants! Realistically, I knew I would be completely safe, but my mind just starting playing tricks on me haha. I’m from the East Coast and it was amazing to fiiiinally get over to WA and try and settle the score regarding who has better sunrises/sunsets…the jury is still out on that one 😉 I can’t wait to get back, there’s just SO much to see and do!